Brand choice varies depending on location and not all locations sell all brands listed on the website. 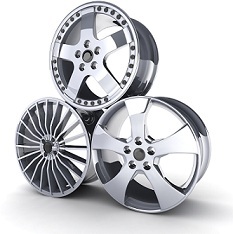 Superior Tire & Auto offers a complete line of wheels to enhance the look of your vehicle. There is a huge selection of styles and finishes available from many different manufacturers. If there is a particular design of wheel you prefer please visit one of our locations and we would be happy assist you in your purchase. Don't Forget Your Accessories – Chrome Wheel Locks, Valves, and Lug Nuts!